A highlight at this year’s TasBus Conference was the presentation of a $10,000 cheque to rock and roll royalty Ronnie Burns for his Appin Hall charity. 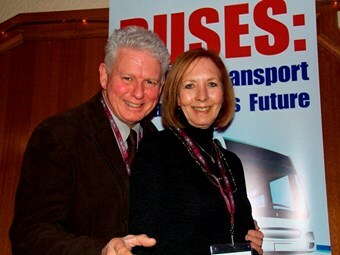 The bus industry presentation to Burns was made at conference gala dinner, packed in with 128 guests following a day of intense conference presentations. Before taking the dinner venue stage for a surprise performance, Burns told ABC Magazine how the donation would help assist children recover from illness and trauma at his respite centre. "We look after children from all over the state, we work with all different sorts of organizations like Camp Quality, Camp Teen, Ronald McDonald House and things like that," Burns says. "The kids come to us with their carers or their organisation and we have a very large facility where we can get them up into the mountains, get them into the fresh air and get the kids away from the technology and the computers and the mobile phones so that they can enjoy the natural environment." Burns says the Appin Respite Centre can accommodate up to 35 people. He says the $10,000 donation, from various Tasmanian bus suppliers, will help with everything from buying new linen to buying musical instruments for the children. "We are very grateful to TasBus association because we actually can’t get there alone," Burns says. "They recognized or looked at what we are doing and saw our vision and their contribution is just fantastic for us. We are just so grateful for their support." Burns has been living in Tasmania with his wife Maggie Burns, pictured, for 14 years and won Senior Tasmanian of the year in 2009. "We are Taswegians now," Burns says. "We will never be leaving here. We always wanted to live here doing this work and being recognized like this." TasBus Managing Director Geoff Lewis says the $10,000 in donations was raised during the past three years. "We’ve now got $10, 000 which is a worthwhile contribution," Lewis says. "We recognize it goes a long way to help these kids."